A quick look at some events that are running as part of the 14th Cathedral Quarter Arts Festival which starts this week. Abie Philbin Bowman: The IMF vs Jedward // 8pm in The Dark Horse // Another year and another promising show from the Irish comic who brought us Jesus: The Guantanamo Years and Pope Benedict: Bond Villain. He has a radical plan to save his country: “Ireland should get Jedward to renegotiate our bailout from the EU and IMF. After half an hour with Jedward, the IMF will give us whatever we want. After half an hour with Jedward, Bono and Bob Geldof, Ireland will own Germany.” £5. Sylvia’s Quest // Leaves The MAC at 3pm and 6pm // Follow Sylvia through “her labyrinth of secret streets and time portals” listening in to “the sounds, voices and worlds which only Sylvia can usually hear’ on the provided headphones as she tries to find her way home. £7. Dress for the weather. Also on Sunday 5 May. St Anne’s: Full Circle // 6pm and 7pm in Writer’s Square // A 22 minute documentarion filmed and edited by Peter Adam about the rise and fall of the original St Anne’s plaza, told through the eyes of the skateboarders. £2. Seo Robert – The Search for Robert McAdam // 8pm in The Baby Grand // a bilingual show (with Irish sections repeated in English) looking a cross-cultural nineteenth century northern Presbyterian Robert Shipboy McAdam. “McAdam was involved in setting up a library, a harp society, a museum and a literary society, he designed and mended steam turbines, made the windows for the Pasha’s Palace in Cairo and still found time to compose music and amass one of the largest collections of Irish cultural treasures on the island. A fascinating insight into one of Belfast’s most eminent Victorians.” £9.50 and £12.50. Sean Hughes: Life Becomes Noises // 8pm, Downstairs at The MAC // Having sold out at January’s Out to Lunch festival, Sean Hughes is back with his one man show about aging and dying, poignant yet light hearted as he reflects on the death of his father. £10. 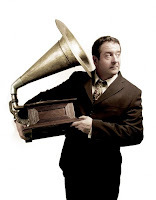 Mark Thomas: Bravo Figaro // 8pm, Downstairs at The MAC // Another father and son tale from another comic. This time it’s Mark Thomas bringing opera to his bed-ridden Methodist-Thatcherite father in his Bournemouth bungalow. £10. The QUBe Myth-Science Space Arkestra perform the music of Sun Ra // 9pm in The MAC Upstairs // Easily the strangest-titled gig at CQAF this year. QUBe are a 16-piece Belfast group of improvisers and experimental musician. Hip hop, New Orleans’ brass, lower east side experimentalism, electronica and noise; custom made costumes, unusual instruments, dancing, and unexpected surprises. £6. If you’re in The Black Box for an event, check out Helena Hamilton’s dizzying monochrome installation in the toilets. Also check out the Open Source #OSBelfast programme running in 25 Lower Donegall Street (building to the left of Belfast Exposed/Northern Visions) during the CQAF festival. Lots of events, workshops and performances already scheduled in to their timetable. And you can even suggest and run your own. The History of the Troubles accordin’ to my Da with Conor Grimes, Ivan Little and Alan McKee is running (again!) in the Grand Opera House from Tuesday 7–Saturday 11 May. The play was originally commissioned ten years ago by CQAF. My spelling is getting worse. Auto-correct means that I no longer even see half the red wiggly lines that should appear under my misspelt sentences. However, spelling bee participants are in a whole different league of enriched word power. The adult actors from local Bruiser Theatre Company in The 25th Annual Putnam County Spelling Bee are totally convincing as the younger characters they are playing. The minimal set – a gymnasium – has a quirky built-in emphasised perspective. The children sitting on the benches include a few familiar faces – volunteers, don’t panic! – from the audience. The audience participation is free from humiliation and they're made into stars of the show. Based on last night’s performance, Basil McCrea may have a career in the Countdown dictionary corner if politics gets the better of him! If you haven’t been to a spelling bee before you’ll soon pick up the pattern of each child stepping up the mic while a fascinating fact about them is read out. A word is announced and before spelling it out the contestant is allowed to ask for the word’s language of origin, its definition or for it to be used in a sentence (rarely useful, often sarcastic, and always funny). If you get a letter wrong, the bell is rung and your time in the competition is up. The characters have impossible names but very believable pubescent issues. The bee progresses, and through flashbacks and bursting into song the audience get to know the contestants and examine their vulnerabilities as the children, one by one, exit the competition. There’s an energy to the cast and the musical score that carries right through the show. While there aren’t any Webber/Rice tunes that you’ll hum on the way home, some of the songs stand out and they’re certainly sung with gusto by the relatively small cast. 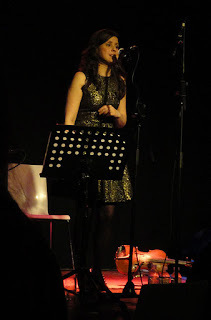 At times some of the lyrics were lost in the noise, but the emotion was still understood. The live band sits up behind the stage and benefits from an enormous percussion section. The show keeps the cast on its toes with plenty of opportunity for improvisation and ad-libbing around the volunteer contributions. Director Lisa May describes being attracted to this “danger” in the script. It means it’ll be a slightly different show every night and the cast won’t be able to just go through the motions. In the end, Spelling Bee is less about words and music, and more about people dealing with their insecurities, coping with competition and expectations, finding friendship and acceptance, and learning to make good choices and live well. It’s unashamedly feel good, a little schmaltzy, very funny, and at the end of a busy Thursday it made me smile from beginning to end. And now I know what a sermuncle is! 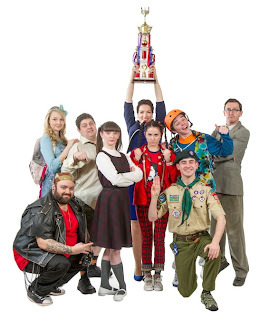 The 25th Annual Putnam County Spelling Bee runs at the MAC until 4 May. Well worth going to see. I'll be back to see what Bruiser get up to next. Stuck in Mexico City for an unexpected three day layover while promoting his epic fifteen hour documentary The Story of Film, filmmaker Mark Cousins decided – in the middle of a press-up – to go out and make a film. He took with him the laminated photograph of Soviet director Sergei Eisenstein. Walking fifteen or so miles a day, he pounded the pavements of the bustling city like a melancholic flâneur, exploring it with Sergei, and filming only using his pocket Flip camera. I talked to Mark after the tonight’s screening at the Belfast Film Festival, appropriately filming him using a Flip camera (for the second time) to find out how his limited equipment had influenced his ad hoc film. A male and a female voice talk over the shaky pictures taken by Mark as he marches all around the city. Sometimes he’ll stop for a rest and a drink. Sometimes the camera will rest on some facet of nature and stare for a minute or two. With a fixed wide angle lens, a short battery life and only a built in mic, the Flip camera is limited to just two kinds of shots – wobbly and stable – depending on whether a tripod was used. The voiceovers are fabulously detailed, referencing poetry and history as well as musing on the meaning of ecstasy. While the slow pace of the film grated at the start, I relaxed into the easy going, free-flowing narrative and warmed to the peculiar plot-less tale. What is This Film Called Love has flashbacks galore – and flashbacks within flashbacks – along with dreams and at least three twists in the last ten minutes of the film. Shot in three days without a thought-out plan, and edited in just nine days, the 77 minute film is a remarkable example of what you can achieve if you give a creative mind a camera and the space to think. Film buffs will love the auditory and visual references to classic movies and soundtracks. You can read more about the editing process on the film’s website and read through the storyboard that Mark crafted and (re)sorted on A6 index cards. Sitting in the soft QFT seats watching Mark and Sergei take a gander around Mexico City, I remembered a weekend in September when I spent long periods walking through Boston city centre and over the bridge to Cambridge to wander around MIT. Fond memories of being solitary in a city, of having time to think and read and watch. Memories shattered as I returned home from the QFT to hear the news of explosions and the unfolding tragedy at the finish line of the Boston Marathon in a city I grew to love so quickly. Provision of DAB radio in Northern Ireland has been weak since its inception. When originally set up, DAB radio had two national multiplexes (bundles) of radio stations (one with BBC stations, the other commercial) that were transmitted all across the UK, supplemented with local commercial multiplexes. Due to frequency constraints – avoiding interference with frequencies already crowded with FM stations in the north and south – the national commercial multiplex was not licenced to operate in Northern Ireland, leaving us short of digital channels and making the DAB radio proposition considerably weaker, demonstrated by low public awareness of DAB in surveys. A frequency – DAB channel 11D – has become free that will allow an additional multiplex to transmit across Northern Ireland, and the UK's national commercial operator Digital One has applied to extend into Northern Ireland. Ofcom consulted during a four week window during February and March, and I read in the Irish News this week that Ofcom had approved Digital One’s licence extension to Northern Ireland, and an additional six transmitters (Divis, Carnmoney Hill, Londonderry, Brougher Mountain, Strabane and Limavady) will start to be built this year. * Since the BBC national multiplexes transmit on the same frequency right across the UK, the channels on each have to be identical. So local BBC stations like Radio Ulster are carried on local commercial multiplexes. Since different multiplexes use different transmitter sites, this explains why DAB coverage for Radio Ulster and Radio 5live are not identical in Northern Ireland. You can check your predicted DAB coverage on the Get Digital Radio website. The Digital One Network being extended to NI carries Smooth, Smooth 70s, Classic FM, Planet Rock, BFBS (GB rather than the NI station already on FM), TalkSport, Premier, UCB UK, Jazz FM, Absolute, Absolute 80s, Absolute 90s. There is some overlap – Classic FM, Kiss, TalkSport and UCB UK – between the Digital One national commercial multiplex and the existing Bauer local commercial multiplex. There is also an anomaly that local station U105 has so far avoided the expense of entering the local DAB market, even though another UTV-branded company operates DAB multiplexes in England. Also worth noting that other than a novel technical experiment a couple of years ago, BBC Radio Foyle is not available on DAB, even from the transmitters in the north west. Digital One predicts its new services will include indoor coverage for 74% of households and 70% of the road network (suspect that's 70% of motorway and primary A roads). An older coverage map from Arqiva (who run the transmitters) was included in one of Digital One’s proposal documents. I think all DAB services should be extended as soon as possible to Northern Ireland. 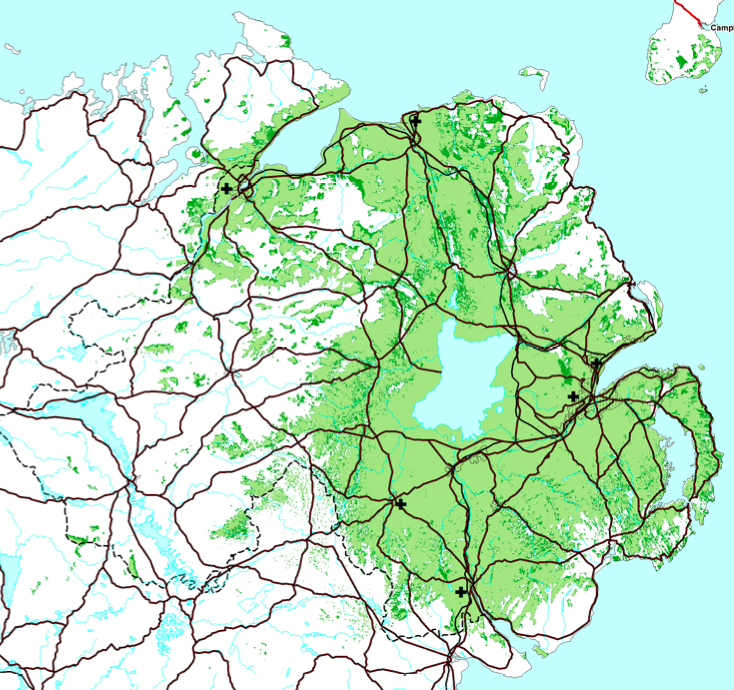 It is simply unfair that we in Armagh and the wider population of NI are not able to receive the range of digital stations that, not only GB residents, but those in Belfast can. May I add that it would surely be unthinkable for any other Government agency to suggest that many people are able to avail of the services already available to those who happen to live in major centres of population. It would be inaccurate to refer to a postcode lottery, since a lottery is chance, whereas digital radio coverage has been specifically planned and implemented to exclude hundreds of thousands of eagerly would- be listeners. Can we in Armagh and other areas please have equality of coverage? Update - The ten new stations launched on 26 July. Great to see the launch of a new blog - Forked.ie - in Belfast tonight. A blog with branded bags and badges ... as well as an appetite for news and views about food on the island of Ireland. The badges were the tell-tale sign that Manuel the Waiter was one of the four resident foodies behind the new venture which merges the talent of Belfast Bites (Laura Clatworthy), Food Belfast (John Ferris), Well Done Fillet (MtD), a cocktail evangelist (Conor Brady) and the Mystery Chef (the 'mystery' being another sign that MtD is involved). Expect bar and restaurant reviews, interviews and gossip with local hospitality industry types, and the mad musings and mutterings of those who make the food and serve it. Hosted in Ox Belfast (recently opened at 1 Oxford Street, just up from the Laganside Courts), the launch packed out the upstairs with screeching eaters, drinkers, owners as well as old and new media folk. The screeching was real: like a rock concert, my ears hurt as I headed back down the street to get my car. Forked.ie has already got off to a great start with a scoop on the closure of the Cayenne restaurant in an interview John Ferris conducted with "the two godfathers of modern Northern-Irish cuisine" Paul Rankin and Michael Deane. Looking forward to what they serve up in the weeks and months to come. With only three years of history at school, my knowledge jumps from Neolithic man to the Roundheads, Cavaliers and Cromwell, and finishes with Franz Ferdinand and the First World War. While my daughter went through a period of devouring Horrible Histories books, I struggled with their mashup of manufactured monstrosity and reality. A Little History of the World was written by Ernst Gombrich and first published in German in 1936. The two hundred and eighty page book blasts through world history at a breakneck speed. Each chapter looks at a period or a character. The prose is anything but staid, launching into minor digressions and asking the reader questions throughout the chatty and energetic text. Egypt, Babylon, an Athenian called Draco (from which we get the word “Draconian”), China, Muhammad, Charlemagne, knights, Popes, Columbus, Joan of Arc, Martin Luther, Ivan the Terrible, Napoleon, Karl Marx, Abraham Lincoln, and lots, lots more. Gombrich also records the industrial and technological advances throughout the ages, while noting the social and political upheaval they cause. Given the broad sweeps of history being covered – the First World War is fitted into four pages – lots of periods and places are left out. The book is unsurprisingly light on Irish history, and local readers will discover that 1690 is not remembered for the Battle of the Boyne! There is relatively little on Africa, hardly anything about South America, and the far eastern references are paltry. Gombrich was an art historian by trade – better known for writing The Story of Art than his children’s history of the world – and moved from Vienna to London in 1936. He worked for BBC Monitoring Service, translating German radio broadcasts during the Second World War, before going back to academic life. Becoming a British citizen in 1947, he received a CBE in 1966 and was knighted in 1972. The original manuscript was supplemented with new material when an English translation was first published in 2005, four years after Gombrich’s death. In particular, the author added a final chapter to reflect on “the history of the world which I have lived through myself”. He talks about the war from both the perspective of his adopted country as well as that of his place of birth. One can be attached to one’s own country without needing to insist that the rest of the world’s inhabitants are worthless. But as more and more people were taken in by this sort of nonsense, the menace to peace grew greater. 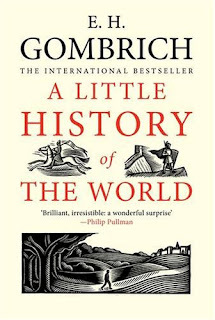 For a non-historian, Gombrich’s history is accessible and a very easy book to read. It’s refreshingly not centred around the British empire and looks at Europe as a whole. For anyone wanting to revise their history and fill in a few gaps, I’d recommend a copy of this book. While originally written as a children’s book – and is certainly simple enough for good readers from aged 10 upwards, or suitable to be read to children as a series of bedtime stories – it also works well with adults! As part of this year’s World Book Night activities on 23 April, I’ll be giving away copies of A Little History of the World.